The activists had hid bamboo poles in nearby fields and when the had out run the police they managed to set up tripods across the road leading to the Coryton refinery, blocking any traffick coming through. 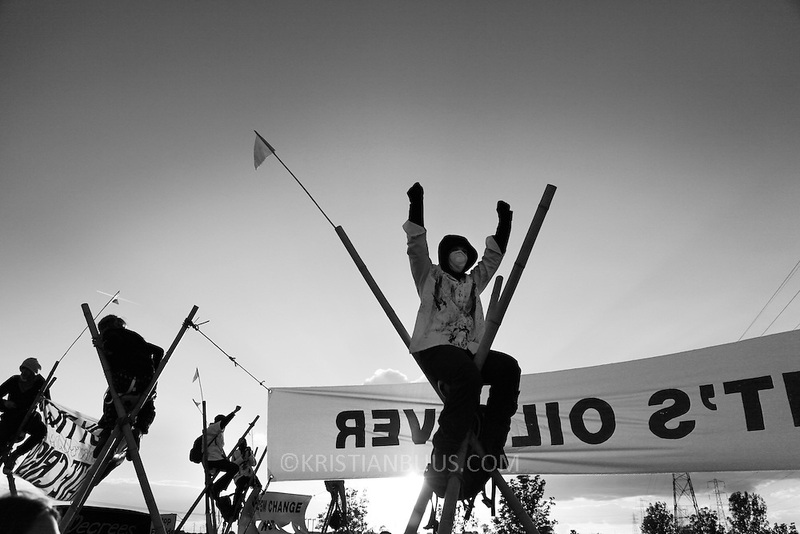 Tall tripods with people on top make it very difficult for the police to clear with out risking causing injuries.Up to 500 activists took part in the two blockades which lasted all day..In the late afternoon it was agreed to end the blockade and head home, calling the day of action a victory for climate action...Crude Oil Awakening is a coalition of climate change activist groups. On Saturday Oct 16 they shut the only entrance to Coryton oil refinery in Essex, UK with the aim of highlighting the issues of climate change and the burning of fossil fuels. The blockade meant that a great number of trucks with oil were not able to leave the refinary during the day of action.